Languages: The official language is Spanish, which is spoken by 98% of the population. Other languages spoken include English, Miskito, Creole, Mayanga, Garifuna, Rama. Major Political Parties: Sandinista National Liberation Front (FSLN), Lets Go With Eduardo Movement, Liberal Constitutionalist Party, Conservative Party. Government: The 1987 Sandinista-era constitution was changed in 1995 to provide for a more even distribution of power among the four branches of government. It was amended subsequently in 2000 to increase the number of members of the Supreme Court and the Controller General's Office and to make changes to the Electoral Laws and again in 2009 to allow the President to run for two concurrent terms in office. Branches: Executive: President and Vice-President and Ministries. Legislative: National Assembly. Judicial: Supreme Court; subordinate appeals, district and local courts; separate labour and administrative tribunals. Electoral: Supreme Electoral Council (CSE), responsible for organising and holding elections. Administrative sub-divisions: 15 departments and two autonomous regions on the Atlantic coast; 145 municipalities. Nicaragua belongs to the UN and to several specialized and related agencies, including the World Bank, the International Monetary Fund (IMF), World Trade Organisation (WTO), UN Educational, Scientific and Cultural Organisation (UNESCO), World Health Organisation (WHO), Food and Agriculture Organisation (FAO), International Labour Organisation (ILO) and the UN Human Rights Commission (UNHRC). Nicaragua is also a member of the Organisation of American States (OAS), the Non-aligned Movement (NAM), International Atomic Energy Commission (IAEA), the Inter-American Development Bank (IDB), the Central American Common Market (CACM) and the Central American Bank for Economic Integration (CABEI). It is an active member of SICA (the Central American Regional Integration System), made up by Belize, Costa Rica, El Salvador, Guatemala, Honduras, Nicaragua, Panama and the Dominican Republic (founded in 1993), assuming the rolling Presidency of this group in July 2012; and of ALBA, the Bolivarian alternative for the Americas, spearheaded by Venezuelan president Hugo Chavez. Other members of ALBA include Cuba, Bolivia and Ecuador. Nicaragua is also a member of the newly formed CELAC, the Community of Latin American and Caribbean States. In Nicaragua, the quality of and access to healthcare are directly tied to income levels. Although state health care is technically free of charge hospital facilities are often understaffed and lack basic medical supplies. Progress has been made in recent years in providing medical services to remote communities, particularly in the RAAN and RAAS with the support of Cuban medical brigades. However, health-care services for the urban and rural poor remains limited. Infectious and parasitic diseases are the leading causes of death. Gastroenteritis and tuberculosis are serious problems. Diseases such as influenza, malaria, typhoid and pneumonia, have returned because of a lack of preventive measures. Outbreaks of dengue fever and A (H1N1) influenza (swine flu) have resulted in a strengthening of preventive measures. Life expectancy: Male: 69.82 years, Female: 74.59 years. Main exports 2010: Total: US $3.157 billion. Coffee, meat and livestock, peanuts, sugar, gold, shrimp and lobster, dairy products and beans. Foreign Direct Investment: US$434.2m (2009), US$508m (2010). Major industries: Mining, fishing, manufacturing (food processing, beverages (including rum), textiles, footwear and chemicals), energy, commerce and services, communications. Nicaragua’s main exports come from the agricultural sector, including coffee, sugar, tobacco, bananas, rice, beans and sorghum. At present, 30% of land available for agriculture and livestock is in use, giving the sector potential for long-term economic growth. However, the effects of tropical storms, and the low international prices on certain products such as coffee, have caused problems for the agricultural sector. Textiles and apparel account for nearly 60% of Nicaragua's exports, but increases in the minimum wage may continue to chip away at the country's comparative advantage in this industry. Nicaragua has widespread underemployment and the second lowest per capita income in the Western Hemisphere. It relies on international economic assistance to meet internal and external debt financing obligations. In early 2004, Nicaragua secured some US$4.5 billion in foreign debt reduction under the Heavily Indebted Poor Countries (HIPC) initiative, and in October 2007, the IMF approved a new poverty reduction and growth facility (PRGF) programme. However, severe budget shortfalls resulting from the suspension of large amounts of direct budget support from foreign donors concerned with recent political developments has caused a slowdown in PRGF disbursements. Similarly, private sector concerns surrounding President Ortega's handling of economic issues have dampened investment. Economic growth fell away in 2009, due to decreased export demand from the US and Central American markets, lower commodity prices for key agricultural exports, and low remittance growth - remittances are equivalent to almost 15% of GDP. In recent years Nicaragua has been reliant upon both oil and financial assistance arriving from Venezuela at beneficial rates. But the government is aware of the potential longer term impact of this and is actively looking to attract more FDI through offering guarantees protecting foreign investments (the UK has had a bilateral Investment and Protection Agreement - IPPA - in place with Nicaragua for a number of years now) and tax benefits. This has resulted in Nicaragua becoming more competitive regionally and being recognised as easier than other locations in the region for doing business. Nicaragua is the second poorest country in the Americas after Haiti with half of the population below the World Bank poverty line. Following earlier progress, in 2009, the World Bank recognised that Nicaragua had achieved Millennium Goal No 1 by reducing extreme poverty to 9.7%, a significant drop on previous years. These efforts have included reducing levels of malnutrition. However there is still considerable work to be done. According to IMF reports, Nicaragua now ranks second in Latin America in terms of the reduction in inequality (Venezuela is the leader), achieving a minus 9.8 percent upon reducing the income GINI coefficient from 0.51 in 2005 to 0.46 in 2009. This improvement is significant when compared to the percent growth rate for Latin America as a whole and considering that this improvement occurred in a period of global economic, social, and environmental crisis. Moves towards regional economic integration in Central America are continuing. 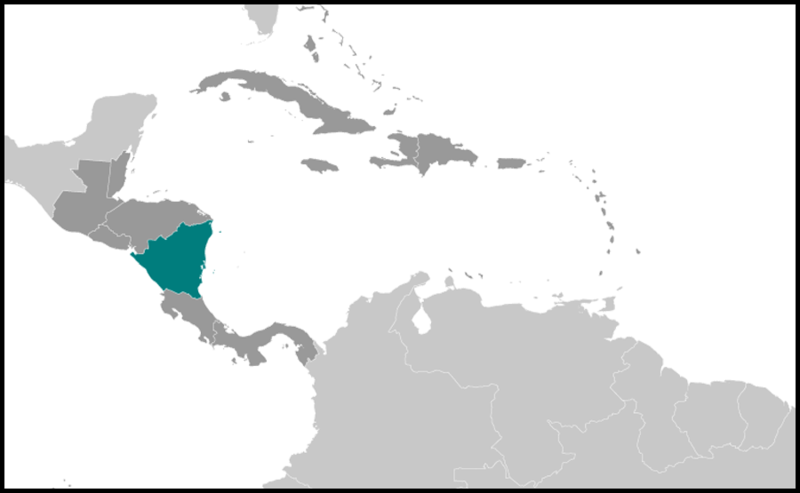 In early 2004, the five Central American countries concluded negotiations with the USA on the Central American Free Trade Agreement (CAFTA). Known in Spanish as the TLC (Tratado de Libre Comercio), the agreement was signed between the USA and Costa Rica, Guatemala, El Salvador Honduras, Nicaragua and the Dominican Republic. El Salvador was the first country to ratify the agreement in December 2004, with Costa Rica being the last in January 2009. The Central America Integrated System (SICA) and the Secretariat for Central Americaian Economic Integration (SIECA) are both positive moves towards regional integration. Nicaragua will chair the rotating presidency of SICA in mid 2012. In 2007, the five Central American countries began negotiating an Association Agreement with the European Union, which included a FTA and cooperation in political and social issues. The CA/EU AA concluded in May 2010 and it is expected to be ratified by the various countries, including Nicaragua, in mid 2012. Approximately 30,000 years ago - earliest evidence of human habitation in Nicaragua. 800 A.D. - Chorotegas and Nicaraos arrive in Nicaragua from Mexico. 1200 - Nicaraos partially displace the Chorotegas from the Pacific basin. The Nicaraos develop a successful agricultural and trade society conducting business with tribes from Mexico to Peru with trading partners. 1502 - Christopher Columbus arrives on the Caribbean shores of Nicaragua on his fourth and final voyage. 1522 - Spanish explorer Gil Gonzalez de Avila names Nicaragua after a local Indian chief, Nicarao. 1523-24 - Francisco Hernandez de Cordoba completes conquest of Nicaragua. 17th-18th Centuries - British arrive and extend their influence over the inhabitants of Nicaragua's Caribbean coast. 1821 - Nicaragua becomes independent but is incorporated into the Mexican empire. 1823 - Nicaragua becomes part of the United Provinces of Central America which also comprise Costa Rica, El Salvador, Guatemala and Honduras. 1838 - Nicaragua becomes fully independent. 1860 - Great Britain signs treaty with Nicaragua establishing Managua’s autonomy over the Miskito Kingdom which was downgraded to status of reservation. 1893 - General Jose Santos Zelaya, a Liberal, seizes power and establishes dictatorship. 1905 - Treaty signed between Great Britain and Nicaragua recognising the absolute sovereignty of Nicaragua over the Miskito Shore while guaranteeing citizens of the region certain privileges for 50-year period. 1909 - US troops help depose Zelaya. 1912-25 - US establishes military bases. 1927-33 - Guerrillas led by Augusto Cesar Sandino campaign against US military presence. 1934 - Sandino assassinated on the orders of the National Guard commander, General Anastasio Somoza Garcia. 1956 - General Somoza assassinated but is succeeded as president by his son, Luis Somoza Debayle. 1961 - Sandinista National Liberation Front (FSLN) founded. 1967 - Luis Somoza dies and is succeeded as president by his brother, Anastasio Somoza. 1972 - Earthquake in Managua leaves 16,000 dead and city centre destroyed. 1978 - Assassination of the leader of the opposition Democratic Liberation Union, Pedro Joaquin Chamorro, triggers general strike and brings together moderates and the FSLN in a united front to oust Somoza. 1979 FSLN military offensive ends with the ousting of Somoza. Estimated 50,000 people killed leading up to his overthrow. 1980 - Somoza assassinated in Paraguay; FSLN government led by Daniel Ortega nationalises and turns into cooperatives lands held by the Somoza family. 1982 - US-sponsored attacks by Contra rebels based in Honduras and Costa Rica begin; state of emergency declared by Nicaraguan government. 1984 - Daniel Ortega elected President. US mines Nicaraguan harbours and is condemned by the World Court for doing so. 1986 - Nicaragua appeals to the World Court in The Hague to end US efforts to destabilise its government and court rules in Nicaragua’s favour. 1987 - The International Court of Justice (ICJ) decides on the amount owed by the US to Nicaragua $17 billion. The US disregards the ruling. 1987-88 - Nicaraguan leadership signs peace agreement and subsequently holds talks with Contras and war winds down. Hurricane leaves 180,000 people homeless. 1990 - US-backed centre-right National Opposition Union defeats FSLN in elections. Violeta Chamorro becomes President. 1991 - Nicaragua formally withdraws its International Court of Justice case thereby abandoning all claims to the judgement. 1996 - Arnoldo Aleman (PLC) elected President. 1998 - Hurricane Mitch causes massive devastation. 2000 - FSLN win Managua municipal elections. 2001 - Liberal party candidate Enrique Bolanos beats his Sandinista party counterpart, former President Daniel Ortega, in the Presidential Election. January 2002 - Inauguration of President Bolanos. March 2002 - Opposition Sandinista party re-elects Daniel Ortega as its leader. August 2002 - Former president and PLC leader Arnoldo Aleman is charged with money laundering and embezzlement during his term in office. 2004 - FSLN win 91 of 152 municipalities including Managua in municipal elections. 2005 - Having spent various stints in prison, under house arrest and in hospital, Aleman is released from custody under the "family co-existence" law allowing him unrestricted movement within the department of Managua. April 2006 - Free trade deal with the US comes into effect. Nicaragua's Congress approved the Central American Free Trade Agreement (Cafta) in October 2005. November 2006 - Ex-president Daniel Ortega wins Presidential elections. 2007 (10 January) Daniel Ortega inaugurated as President for the second time. December 2006 - Ex-president Daniel Ortega wins Presidential elections with 38% of the vote. March 2010 - Regional elections see the FSLN win the majority of seats in the RAAN and the PLC in the RAAS. November 2011 - Daniel Ortega secures a third (and second concurrent) term as President with 62% of the vote and a clear majority in Parliament. The court ruled that Costa Ricans navigating on the river were not required to have Nicaraguan tourist cards or visas as Nicaragua alleged but, ruled that Costa Rican boats and passengers have to stop at the first and last Nicaraguan port along their route. The issue flared up again in late 2010 with Costa Rica claiming that Nicaraguan troops had set foot on Costa Rican soil. Recent construction of a road by Costa Rica on their side of the river, alongside the border, and alleged incursions by Nicaraguan military personnel continue to keep tensions raised. The case has been filed at the ICJ with further discussions pending in 2012. Nicaragua has submitted its case to the International Court at The Hague for resolution of a territorial dispute with Colombia over the Archipelago de San Andres y Providencia in the Caribbean. According to a 1928 treaty between the two countries, Colombia owns San Andres and its territorial waters. Nicaragua has declared the treaty invalid. Both Costa Rica and Honduras have recently requested permission to intervene in the proceedings on the basis that the disputed territory includes maritime areas in which they have an interest. A participant of the Central American Security Commission (CASC), Nicaragua has taken a leading role in pressing for regional demilitarisation and peaceful settlement of disputes within states in the region. At the 1994 Summit of the Americas, Nicaragua joined six Central American neighbours in signing the Alliance for Sustainable Development known as the Conjunta Centroamerica-USA or CONCAUSA, to promote sustainable economic development in the region. On 10 October 2005, the Nicaraguan congress ratified the Central American Free Trade Agreement (CAFTA) between the US, the Dominican Republic and other Central American Countries. In May 2010 the European Union and Central American states reached an agreement to liberalize trade and cut import tariffs. This agreement, the so-called EU Association Agreement, is expected to be approved by the EU in mid 2012 and should help improve bilateral trade for all EU Member States. The British Embassy in Nicaragua closed at the end of March 2004. HM Ambassador to San Jose covers Nicaragua as non-resident Ambassador and resides in San Jose, Costa Rica. Andrew Rosindell MP visited Nicaragua in 2011. Peter Kilfoyle MP led a Parliamentary visit in September 2009. 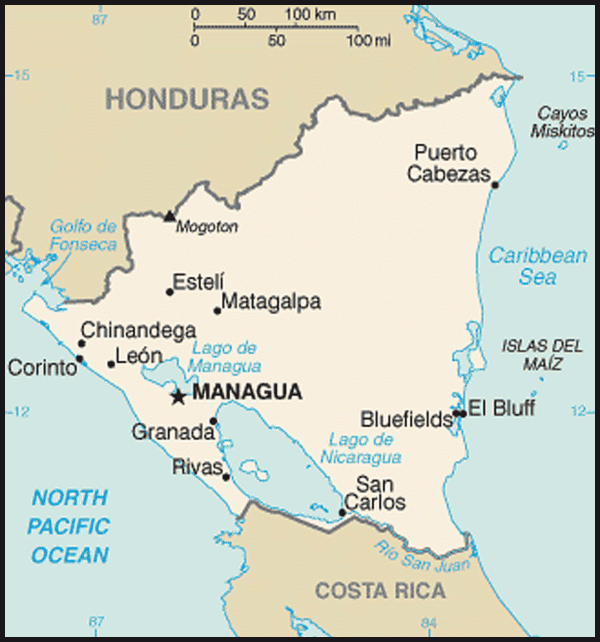 Nicaragua is the largest of the Central American States, with an area of 147,950 sq km. It is bordered to the north by Honduras, to the south by Costa Rica, to the east by the Caribbean and to the west by the Pacific. There are three distinct regions. The Pacific coastal region is a fertile lowland plain, broken by active volcanoes and lakes (Lake Nicaragua is the second largest in Latin America and one of the largest in the world). The North Central region is mountainous, cooler and also very fertile, while the Atlantic region which comprises 60% of the country’s territory, is a large lowland plain characterised by tropical rain forests and rivers. Nicaragua has been reclassified as a middle income country, and as of April 2009 no longer receives direct budget support from the UK. The Department for International Development (DFID) closed its Managua office in April 2009and maintained its programmes in Nicaragua until 2011. The Nicaragua programme was managed from the DFID Caribbean Office in Barbados and delivered through partnerships with the Word Bank and other development partners. For more information please visit the DFID (http://www.dfid.gov.uk) website. The British government contributes about £4.5m annually to European Union Cooperation programmes in Nicaragua. The British Embassy supports a range of small scale but targeted projects in Nicaragua This has included projects in the Caribbean Coast region, including a Prison Reform Campaign to improve conditions for juvenile and women prisoners. Current projects also include support to street children in Managua and providing electricity through solar panels to impoverished rural communities. The Embassy will look to assist the Nicaraguan government with its rule of law and good governance development and will monitor the human rights situation in the country. Nicaragua is a constitutional democracy with executive, legislative, judicial and electoral branches of government. In 1995, the executive and legislative branches negotiated a reform of the 1987 Sandinista constitution which gave extensive new powers and independence to the legislature – the National Assembly. These include permitting the Assembly to override a presidential veto with a simple majority vote and eliminating the President's ability to veto a bill. Both the President and the members of the unicameral National Assembly are elected to concurrent 5-year terms. The National Assembly consists of 90 deputies elected from party lists drawn at the department and national level, plus the out-going President and runner-up in the Presidential race, for a total of 92. The November 2011 Presidential and Parliamentary elections saw President Ortega gain a clear majority in Parliament for the first time. It remains to be seen what this will mean. The Supreme Court supervises the functioning of a rather stretched judicial system as well as holding, via the Constitutional Chamber (political appointees of favourable disposition to the ruling FSLN party), responsibility for the constitution. As part of the 1995 constitutional reforms, the independence of the Supreme Court was strengthened by increasing the number of magistrates. Supreme Court Justices are nominated by the political parties and elected to 5-year terms by the National Assembly. In October 2009, the Constitutional Chamber controversially ruled that the constitution was "unconstitutional" in preventing the President from standing for a second consecutive term, and passed a ruling (without right to appeal) that the President should not be barred from re-election. In November 2011 Daniel Ortega led a successful presidential election campaign and his party won a clear Parliamentary majority. The November 2006 Presidential and National Assembly elections saw Daniel Ortega, Frente Sandinista (FSLN) win the Presidential election in the first round with 38% of the votes, with Eduardo Montealegre, Alianza Liberal Nicaraguense (ALN), gained 28%, Jose Rizo, Partido Liberal Constitutionalista (PLC) 27%, Edmundo Jarquin, Movimiento Renovador Sandinista (MRS), just 6% and Eden Pastora, Alternativa por el Cambio (AC), less than 1%. Voter turnout was estimated at 70%. Daniel Ortega was sworn in as president on 10 January 2007. Election monitors at the time reported that the elections were generally well run. On the contrary, the November 2008 Municipal Elections, were marred by widespread irregularities and fraud, which has undermined the credibility of the electoral branch of government, the Supreme Electoral Council (CSE). Credible Nicaraguan and international observer organisations were not allowed to observe the elections. Ortega's administration resolutely refused to revisit the election results and insisted that they followed the rules. The lead up to the 2010 municipal elections saw the CSE ban two opposition parties, the dissident Sandinista Party MRS and the Conservative Party (PC), from taking part in these and the 2011 Presidential elections. The CSE cited 'incompletion of electoral law requirements' on the part of these parties, but the decision was widely read as purely political and a threat to democracy in Nicaragua. The recent November 2011 Presidential and Parliamentary elections have been marred by allegations of irregularities in the electoral process. Whilst Ortega is generally accepted as being the legitimate winner of the Presidential elections, the margin of victory, in both this and the the Parliamentary elections, has raised concerns within the international community. The EU Observer Mission’s final report is due to issue in late January 2012. A long and destructive civil war fought throughout the 1980's caused widespread disruption and led to the victorious Sandinistas clamping down on political opposition while progress made in the areas of health and education dissipated significantly. Revoking their promises for an open political society, they banned opposition in the media and restricted rival political parties. The Contra rebels used hit and run tactics that largely targeted civilians and infrastructure. Freedom of speech is a right guaranteed by the Nicaraguan constitution. However, there are some concerns regarding limitations of this right as the FSLN government has repressed opposition demonstrations and harassed opposition politicians and journalists using street gangs. The premises of independent media outlets have also been vandalised. 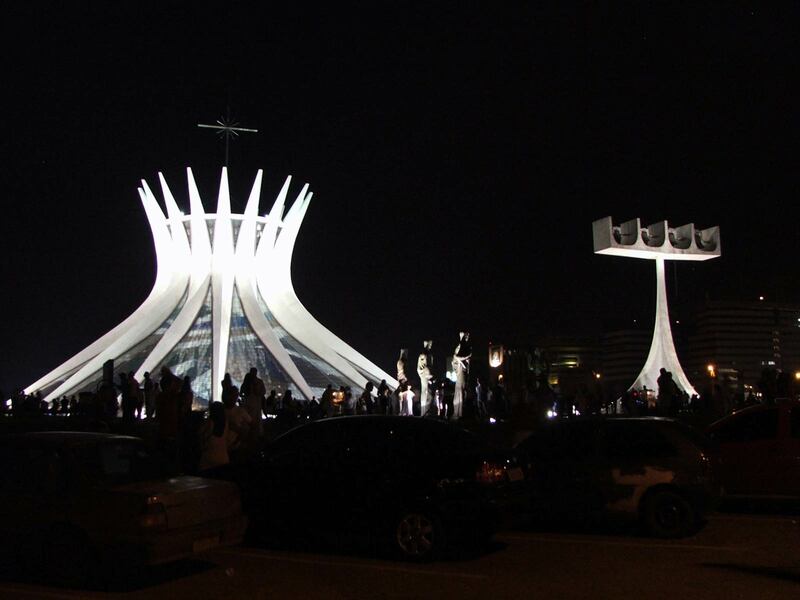 However, the run up to the November 2011 elections, and the Election Day process itself, passed off peacefully. Subsequent outbreaks of violence were limited to specific regional hotspots rather than being in contravention of freedom of speech rights. Other constitutionally guaranteed freedoms include peaceful assembly and association, freedom of religion and freedom of movement within the country as well as foreign travel, emigration and repatriation. The government allows national and international human rights monitors to operate freely in Nicaragua. Aside from the issues regarding freedom of speech, human rights concerns centre around prison conditions, increasing prostitution, abortion rights and cases of corruption within the judiciary. Many cases of child abuse and illegal trafficking in children have also occurred in Nicaragua. The UK is concerned about human rights abuses wherever they occur. The British Embassy monitors reports or repression against opposition figures and the media. We raise our concerns about human rights issues in the framework of our bilateral relations and in international fora. In Nicaragua there are several areas of concerns in the rule of law and good governance areas. The overall context is the overwhelming poverty in the country. International assistance programmes provide police with extensive training and police trainees must receive human rights instruction to graduate from police academy and become officers. The UK has also offered specific technical assistance in this area. The judicial system is overburdened. There is an increasing groundswell of public support for measures which attack corruption in government, strengthen the democratic process and encourage transparency.